With holiday season in full swing, the folks at the U.S. Consumer Product Safety Commission (CPSC) want to remind Americans to be careful and avoid holiday safety hazards -- such as accidentally lighting the tree on fire. "Christmas and the days around it are typically some of the top days for home fires," said Greg Cade, division director of Government Affairs for the National Fire Protection Association. "With an increased fire risk around winter holidays, following safety tips at this time of year is especially important to prevent fires." Holiday-related injuries appear to be on the rise in recent years, according to CPSC. Between 2008 and 2010, property losses caused by Christmas tree fires have increased from about $18 million to $19 million. During this time, candle-related fires have resulted in $347 million in property damages, killing 74 people. Overall, injuries related to holiday and other decorations have risen from 12,000 cases in 2009 to 14,000 cases in 2011. "We want consumers to avoid fires and injuries by adding 'safety' to their holiday checklist," said Inez Tenenbaum, chairman of CPSC. What can be done to reduce your risk of fire during the holidays? CPSC recommends keeping the tree away from heat sources such as fireplaces, vents, and radiators. Trees can dry rapidly in heated rooms, causing needles to fall and potentially rasing fire hazard risk so keep the tree stand filled with water, and also keep it away from foot traffic and doorways. 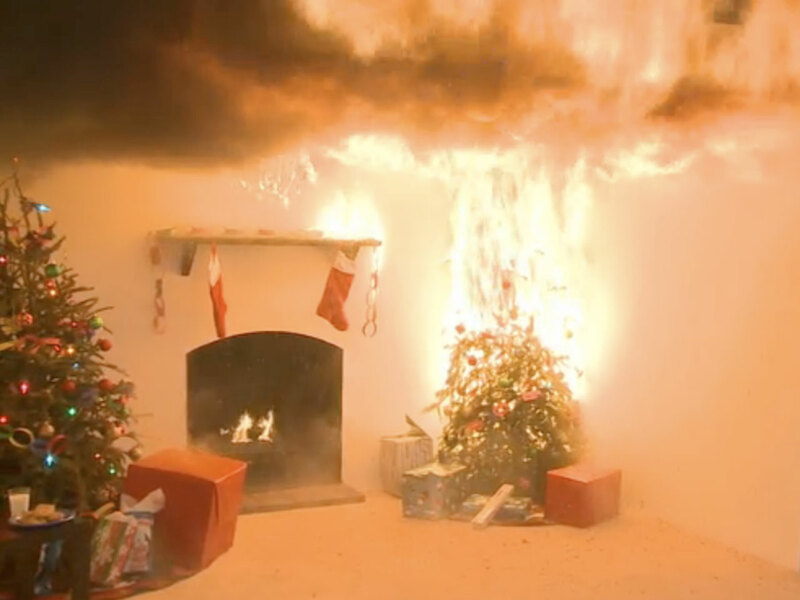 If you are buying an artificial tree, make sure it's fire resistant. Aside from fire hazards, the CPSC recommends avoiding sharp decorations or trimming that resembles candy, so young kids don't get hurt. Other safety tips include keeping burning candles within sight and on stable surfaces so kids and pets don't knock them down, checking all holiday lights for cracked sockets or frayed wires and making sure your extension cord is in good condition. Also, make sure outdoor lights are labeled specifically for outdoor use and use lights that have been tested by a nationally recognized testing laboratory, such as Underwriters Laboratories. And if you're hanging lights or decorations, make sure you select a safe, sturdy ladder. The CPSC has more information in a holiday safety video.